Comments Off on Eviction—Impairment of value and utility of building—Impairment is to be perceived from view point of landlord and not of tenant. Comments Off on Eviction—NRI Landlord—Leave to Defend—Merely because one of the co-owner of the building had let out the premises and was accepting the rent; it would be mean that there has been partition among the co-owners. Comments Off on Eviction—Personal Necessity—Need for space for stay of married son, daughter or sister even occasionally on their visit to parents/brother is bonafide personal need. Comments Off on Eviction–Cease to Occupy- -Tenant contented that she is running tea shop but failed to prove purchase of any material for preparation of tea or any other food articles which she may be selling from said shop—Eviction upheld. Eviction—Personal Necessity—Merely because the children for whom the business was pleaded to be started were not examined, cannot be fatal to the case of the landlords. Eviction—Personal Necessity—Joint property—All the landlords need not to be examined in order to prove bonafide personal necessity on their part. Comments Off on Eviction—Personal Necessity—Merely because the children for whom the business was pleaded to be started were not examined, cannot be fatal to the case of the landlords. Eviction—Personal Necessity—Joint property—All the landlords need not to be examined in order to prove bonafide personal necessity on their part. Eviction-Impairing value and utility—Merely with increase of rent, the action of the tenant to impair materially the value and utility of the building cannot be deemed to have been condoned. Comments Off on Eviction-Impairing value and utility—Merely with increase of rent, the action of the tenant to impair materially the value and utility of the building cannot be deemed to have been condoned. East Punjab Urban Rent Restriction Act, 1949, S.13–Eviction–Merger of Tenancy—Two separate tenancies—Merely because rent is being jointly paid from one account, there cannot be any merger of the tenancy. 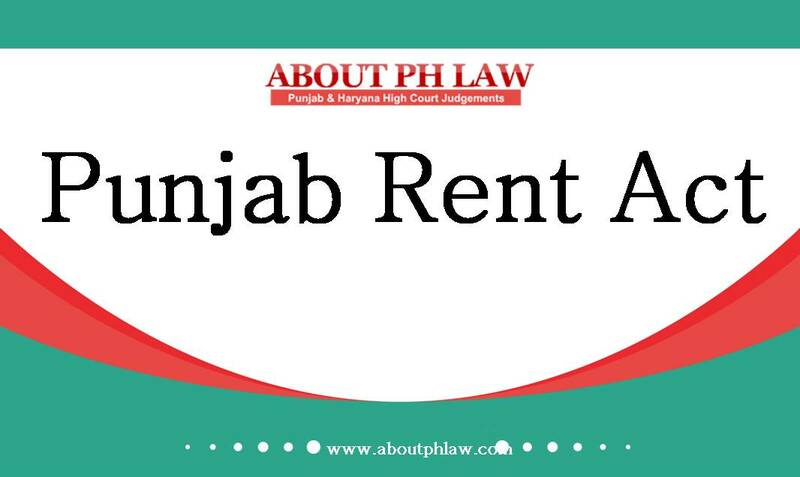 Comments Off on East Punjab Urban Rent Restriction Act, 1949, S.13–Eviction–Merger of Tenancy—Two separate tenancies—Merely because rent is being jointly paid from one account, there cannot be any merger of the tenancy. East Punjab Urban Rent Restriction Act, 1949, S.13—Eviction—Bonafide Need—At some places, the landlord is asking for bonafide requirement of both the sons, whereas in some part of the evidence he is pleading requirement of only one son—Held; it cannot be held that bonafide requirement is not proved. Comments Off on East Punjab Urban Rent Restriction Act, 1949, S.13—Eviction—Bonafide Need—At some places, the landlord is asking for bonafide requirement of both the sons, whereas in some part of the evidence he is pleading requirement of only one son—Held; it cannot be held that bonafide requirement is not proved. East Punjab Urban Rent Restriction Act, 1949, S.13–Eviction–Bonafide Need-Merely because landlady has sufficient resources at her disposal for surviving, cannot be used as a doubtful circumstance to hold that she does not require the premises–The Courts or the tenant have no jurisdiction to substitute their own opinion in place of the landlord—The jurisdiction of the court is only to examine whether the premises is a bonafide requirement or not. Comments Off on East Punjab Urban Rent Restriction Act, 1949, S.13–Eviction–Bonafide Need-Merely because landlady has sufficient resources at her disposal for surviving, cannot be used as a doubtful circumstance to hold that she does not require the premises–The Courts or the tenant have no jurisdiction to substitute their own opinion in place of the landlord—The jurisdiction of the court is only to examine whether the premises is a bonafide requirement or not. Eviction–Bonafide Need-Admittedly, landlord was 80 years old and had already let out two other shops on rent-Since two sons of landlord had died so in order to maintain families of his son the desire of the landlord to set up business in the demised shop after getting it vacated, is legitimate and justified—Eviction petition allowed. Comments Off on Eviction–Bonafide Need-Admittedly, landlord was 80 years old and had already let out two other shops on rent-Since two sons of landlord had died so in order to maintain families of his son the desire of the landlord to set up business in the demised shop after getting it vacated, is legitimate and justified—Eviction petition allowed.